Need a replacement for a missing tooth or multiple teeth? 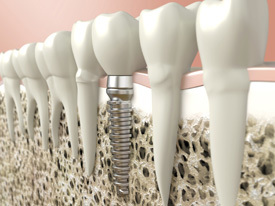 The first step is a dental implant to replace the root of the tooth so that we can place a restoration on top of it. 1. We take a 3D X-ray of your mouth (similar to a CAT Scan). The X-ray and the CEREC® unit allow us to create a 3D implant. 2. With the pre-planned guide, the implant goes precisely where it needs to be. And, while an implant is a replacement for the root structure of a missing tooth, the implant goes unseen. 3. After settling for a few months, we’ll place an abutment on it and then the crown will go on top. Then, the process of replacing a lost tooth is complete! Creates a sturdy foundation for the final restoration (crown, denture, or hybrid). Providing gentle, precise care in a welcoming environment.